DESCRIPTION FROM THE PUBLISHER: Drawing from his own remarkable experience as a veteran classroom teacher (still in the classroom), Ron Berger gives us a vision of educational reform that transcends standards, curriculum, and instructional strategies. 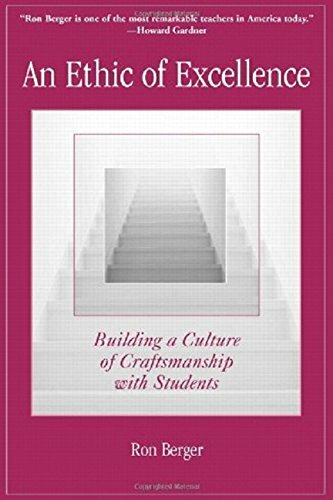 He argues for a paradigm shift – a schoolwide embrace of an -ethic of excellence.- A master carpenter as well as a gifted teacher, Berger is guided by a craftsman’s passion for quality, describing what’s possible when teachers, students, and parents commit to nothing less than the best. But Berger’s not just idealistic, he’s realistic – he tells exactly how this can be done, from the blackboard to the blacktop to the school boardroom.